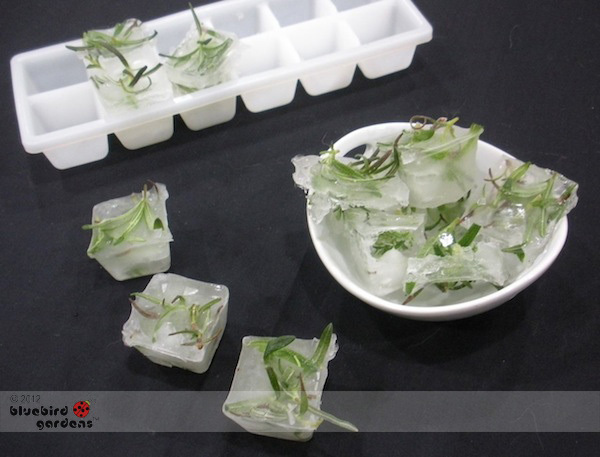 Don't throw them away; freeze chopped herbs in ice cube trays for later use. Rosemary is one of my favorites. Cut off sprigs. Wash. Pat dry. Cut or break 1/2 inch pieces and fill ice cube trays. Add water. If you use rosemary in soups and stews, add unsalted chicken or vegetable stock. Once frozen, pop out of trays and store cubes in a freezer bag. One of my friends now expects to get a supply for her fall birthday. Another one wanted some as a housewarming gift so I know these also make great practical gifts ideas. Have you frozen any of your herbs?